Over the last eight days, Google has seen its subsidiary Motorola Mobility lose a couple of German patent lawsuits (1, 2) because its Android-based ddevices were found to infringe patents held by Apple and Microsoft. A new U.S. lawsuit filed yesterday by Massachusetts-based Skyhook Wireless adds to Google's Android patent worries and also targets the Google Maps service in general. U.S. Patent No. 7,856,234 on a "system and method for estimating positioning error within a WLAN-based positioning system"
U.S. Patent No. 8,022,877 on "systems and methods for using a satellite positioning system to detect moved WLAN access points"
U.S. Patent No, 8,154,454 on "systems and methods for using a satellite positioning system to detect moved WLAN access points"
U.S. Patent No. 8,223,074 on "systems and methods for using a satellite positioning system to detect moved WLAN access points"
U.S. Patent No. 8,242,960 on "systems and methods for using a satellite positioning system to detect moved WLAN access points"
U.S. Patent No, 8,229,455 on a "system and method of gathering and caching WLAN packet information to improve position estimates of a WLAN positioning device"
U.S. Patent No. 8,054,219 on "systems and methods for determining position using a WLAN-PS estimated position as an initial position in a hybrid positioning system"
U.S. Patent No. 7,471,954 on "methods and systems for estimating a user position in a WLAN positioning system based on user assigned access point locations"
The titles of these patents show pretty well what Skyhook's technology is all about: geolocation based on nearby WiFi (WLAN) access points, a technique that has become very popular, one of the reasons for its success being that it also works in buildings in which GPS generally doesn't work. All of these patents but one (the last one) were issued by the United States Patent and Trademark Office after the earlier lawsuit was filed in the District of Massachusetts. 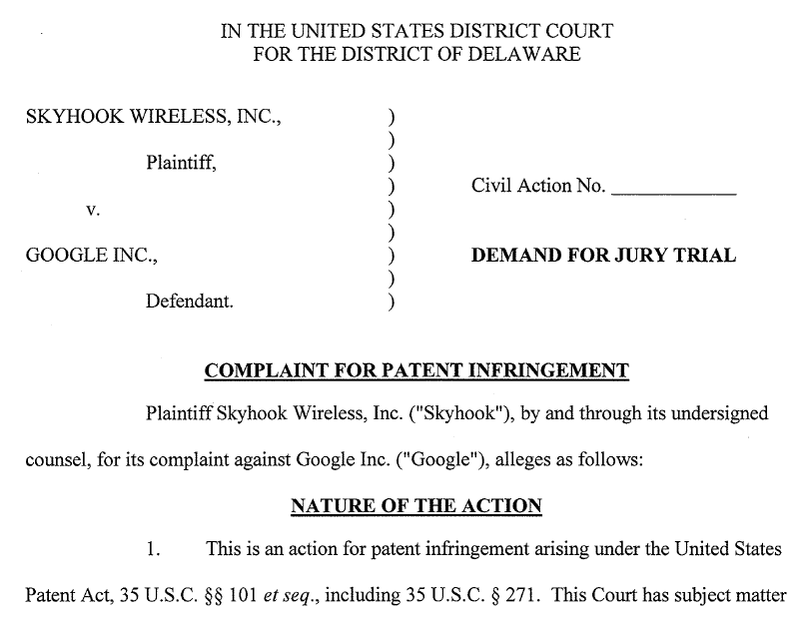 Like in its earlier patent lawsuit, Skyhook alleges willful infringement, pointing to business negotiations between Google and Skyhook in 2006 and 2007. Its choice of the District of Delaware for this filing suggests that Skyhook wasn't entirely pleased with how things were going in its home court in the District of Massachusetts. Two of the patents that Skyhook was asserting in that earlier patent case were deemed indefinite by a federal judge in a recent summary judgment motion. 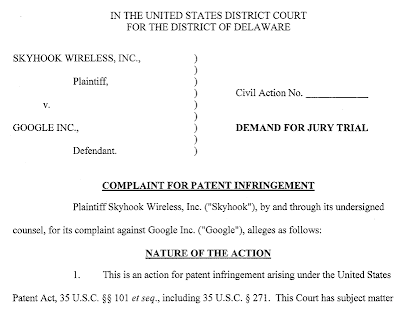 But Skyhook's new lawsuit sends out a clear message: invalidating a patent or two won't solve the problem for Google since the company has been issued new geolocation patents all the time since the filing of its first infringement action. It looks it won't be done with Google anytime soon, and has been building a true patent thicket surrounding WiFi-based geolocation technologies. I wouldn't be surprised to see Google file a motion to transfer this case out of Delaware, but if Google asked HTC, that company has actually been quite happy with the delay that resulted from a sweeping decision to stay various Apple lawsuits. HTC has recently achieved that newer Apple filings brought in the Southern District of Florida and the Eastern District of Virginia were transferred to Delaware.